Sarah of The Delicious Life is hosting the 21st edition of Sugar High Friday. This month’s theme is “Ice Ice Baby”, here are Sarah’s instructions: How you interpret Ice Ice Baby is up to you – churn your own ice cream, freeze a fruit ice, build a sundae, hug two cookies around a snowball and call it a sandwich, or create some other de-luscious thang that’ll help us cool down in the high heat of summer. Anyone who has been reading my blog this last month should know that this theme shouldn’t be a problem for me. The other night my friend received a large quantity of blueberries from a friend of his who went blueberry picking. He had so many blueberries he almost didn’t know what to do with them, but then he decided he wanted to make a blueberry sorbet. He called me up and asked me if I wanted to help. Since I have never made blueberry sorbet before I was curious and agreed to help him. I invited him over and we searched for some blueberry sorbet recipes. 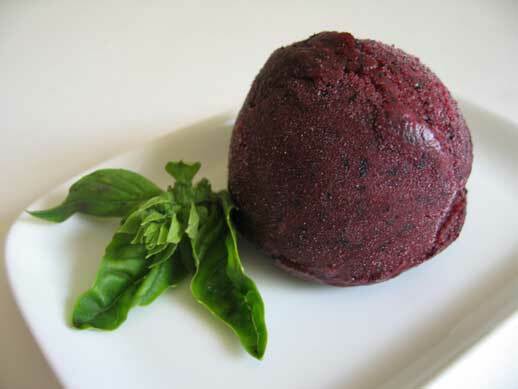 We decided to use a simple blueberry sorbet recipe which we found on epicurious. We did however alter the recipe by adding 5 medium-sized leaves of basil and 2 tablespoons of vodka to the original recipe. We added the basil and the vodka during the blending process. It was a simple and refreshing sorbet, which definitely tasted of blueberries with a small hint of basil. Posted by Sam at 9:11 p.m.
A lovely combination, Sam! And nice of your friend to give you the extra blueberries! The blueberry-basil sorbet was very refreshing! Friends are great! Any excuse is a great excuse to experiment and fool around in the kitchen. It is always fun making things with friends in the kitchen. i could put that little sorbet ball in my mouth right now! Your picture makes me want to eat blueberries(allergic to raw ones)...it might be worth it to swell up for awhile for a bite of that. Sam - you have the most interesting combinations! I still have to try making the sweet corn ice cream...I can't keep up with you! It looks like a great end to a summer meal--and I always like to find a way to add a bit of alcohol to desserts! I'm not a fan of drinking strong stuff, but I often add it to sweets to give the sweetness an edge. I wish I too was blessed with an abundance of fresh blueberries! I think my mum and I will make some blueberry spiced jam this weekend...let's see if I can find great fresh fruit! We went to Bar Harbor, ME last year, and had Blueberry Basil Sorbet at this ice cream shop. We have been looking for a recipe for it ever since. I just bought 2lbs of blueberries, and I am going to make this tomorrow!! !